The work plan for ELECTRIFIC is divided into 10 separate work packages (WP), altogether lasting 36 months. This work plan requires high collaboration and therefore several partners need to be involved in each WP. The structure of the project has been selected to satisfy the principle of a lean and simple structure with few WPs working in close cooperation, guided by a set of customer and market-based requirements that are implemented in an incremental manner and verified with the final user in a continuous cycle. WP1 'Project management' will ensures that the project is executed according to plan and reaches the expected results and impact, managing the contract and keeping a fluent communication to the EC Officers. WP2 ‘Scenarios, Requirements and Metrics’ is serving as a clamp for the technical part of the project: at the beginning it elaborates the general setting containing stakeholders and business rules and constraints and designs the generic target vision as well as visions for the trials. From these visions its extracts user requirements, giving input to the scientific and technical work. It will also define the metrics that monitor the performance of driving EVs, the level of grid integration as well as the look-and-feel of driving an EV. 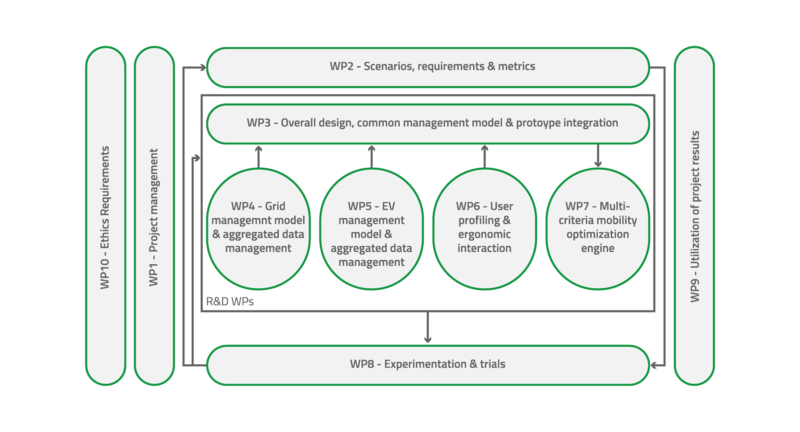 WP3 ‘Overall Design, Common Management Model and Prototype Integration’ will be responsible, throughout all the project, for providing the solution technical framework built on top of a distributed SOA and Big Data architecture in which the prototype will be continuously integrated. It will also design the common information model for the solution, for which data assets will be developed. WP4 ‘Local Grid Management and Data Aggregation’ will enable grid-friendly Smart Charging Stations for which it will investigate both centralized (grid-wide) and decentralized (self-autonomy of charging station) data gathering techniques. WP5 ‘EV Management and Data Aggregation’ will research the possibilities to support battery friendly management of a fleet of EVs from a short-term (operational aspects of car fleet management on a daily basis) and a long-term perspective (focus on a battery health monitoring system that advices fleet management how to optimize car elements). WP6 ‘Psychological User Profiling, Ergonomic Interaction and Behaviour Change’ will use psychological and usage-based user profiles to develop ergonomic guidance techniques. In line with the integrated optimization solution, these techniques will make it easy for users act in their own long-term interest by extending EV range, EV battery life and the sustainability of their mobility needs. The ensuing boost in convenience has the potential to drastically increasing EV attractiveness overall. WP7 ‘Advanced EV Driver Assistance Services’ will develop novel EV travel planning and charging scheduling algorithms that will assist the EV driver with utilizing her vehicle in a way that is both more convenient for her and more friendly to the grid. WP8 ‘Experimentation and Trials’ will focus on the demonstration and testing tasks of the solution through experiments and small-scale trials in real environments, reporting after each phase the obtained results. Preliminary results will serve as feedback to the R&D work packages for the solution refinement and improvement. WP9 ‘Utilization of Project Results’ will ensure the project reaches the expected impact related to both scientific community and market awareness and expectations. The WPs, together with their interaction, is shown in the diagram above. The need to speed up the availability of results is especially critical such as to have early working elements usable in testing and evaluations. On the other hand, ELECTRIFIC partners are also well aware of the challenges of collaborative and distributed projects, which indeed raise the bar of cooperation complexities in comparison with single organization settings. ELECTRIFIC will apply Agile Development methods although that Agile Development for large distributed collaborative projects is indeed a challenge. The Consortium will rely on an adapted version of Agile, in which development methods and techniques are combined with the structure necessary for a large and distributed collaboration effort . WP10 ‘Ethics requirements’ sets out the 'ethics requirements' that the project must comply and ensure their compliance throughout the project.